March 15, 2004—Digispec (ppai/180432, asi/49716) is pleased to announce the acquisition of Utah-based DataPad (ppai/111805, asi/48545) in a move designed to strengthen Digispec's position as the industry's leading mousepad manufacturer and supplier. In January 2003, DataPad approached Digispec about a possible purchase. At that time, Digispec had just finalized their purchase of Minneapolis-based computer accessory supplier XJD and was busy integrating XJD's customers and products. To enable DataPad to avoid bankruptcy, an interim agreement was reached with an investment group organized by Digispec's President, Ed Hamilton. This allowed DataPad and Digispec to work closely together but remain separate operating entities. Now, with the final phases of the transaction complete, the two operations have been merged. Digispec plans to maintain DataPad's Lindon, Utah production facility and to utilize all of their sales and customer service staff. "DataPad's sales and customer service reps will make a great addition to Digispec's service team", comments Digispec President Ed Hamilton, "and the experience of their production crew is essential for the production of DataPad's specialty products." selection of mousepads from a single vendor," says Hamilton. Digispec, established in 1983, manufactures a complete line of both hard surface and fabric mouse pads. At the 2004 ASI show in Orlando, Digispec received the distinguished ASI Distributors' Choice Award for Computer Accessories for the fourth consecutive year. In addition, Digispec has received the ASI Spirit Award for Customer Service Excellence, the PPAI Golden Achievement Award for Most Beneficial Distributor Marketing Aids, and the PPAI Supplier Star Award of Merit. 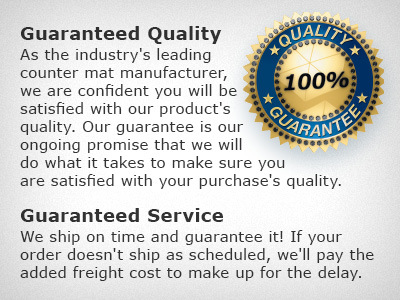 In 2001, Digispec established CounterPoint, a division dedicated to the manufacture of counter mats.